Guest Post: Are You Modeling the Christian Life for Students? As a teacher, there are certain things I am expected to teach my students. They are expected to know how to add, subtract, and multiply. They should be able to write in complete sentences and they should be able to identify the main idea from a story they have read. In addition, there are behaviors the students are expected to perform. I want them to be able to raise their hands, walk in a line, and treat each other with respect. As a youth pastor, there are certain things that I want my students to do as well. I want them to have a passionate prayer life. I want them to have a daily quiet time and to love the Word of God. I want them to memorize Scripture. I want them to make Jesus an integral part of their lives, not just something else they plug into an already busy schedule. As a teacher and as a youth pastor, how do I accomplish these things? How do I move beyond simply telling them that reading their Bible is important? I have to model it for them. When I am teaching a multiplication lesson, I will fail if I just stand up and tell the students in my class how to do the problem and why it is important. They will stare at me and very few in the room will understand what I just said. If I truly want them to understand the concept of multiplication, I have to model the steps of how to solve the problem. I have to show them several times. The same is true for the Christian life. I can tell the students in my youth group that reading the Bible is important and that they should have a daily quiet time. I can explain why it is important, but until they see it being done in my own life, I will fail to have the desired impact. I can teach about prayer and why we need it, but until the students see that prayer is a non-negotiable part of my Christian life, it becomes nothing more than a bunch of words. We all want to have a huge impact on our students and their lives. We all dream that one of our students will be the next Billy Graham, Andy Stanley, or David Platt. If we truly want to sow the seeds to help that happen, we need to model it for them. They need to see we mean what we say. 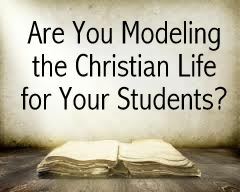 How are you modeling for your students that the Christian life is important? This guest post was written by Jonathan Pearson is a teacher and student pastor. He is currently searching for a student pastor position. Check out out his blog for more great thoughts on student ministry.